From the Start screen, tap the Desktop tile to enter the Desktop app. Easily identified, the Desktop app’s tile always wears the same background image that’s splashed across your desktop. From the desktop, slide your finger in from the right to fetch the Charms bar, and then tap the Settings icon. The Settings pane appears along the screen’s right edge. Tap the words Control Panel at the top of the Settings pane. The Control Panel breaks down its settings into eight categories that loosely describe their contents. Adding to the confusion, sometimes choosing a Control Panel item shuttles you off to the PC Settings screen, where you flip the required switch. To find a setting quickly, open the Charms bar from the Start screen, and then tap the Search icon. Tap in the Search pane’s Search box, and type in the name of your sought-after setting — security, for example. Then tap the Search pane’s Settings icon to direct the search to Settings. The screen immediately lists every security-related setting; tap a setting to head there quickly. Make the desktop Control Panel show icons instead of categories by tapping the View By drop-down menu in the window’s top right corner, and then choosing either Large Icons or Small Icons. 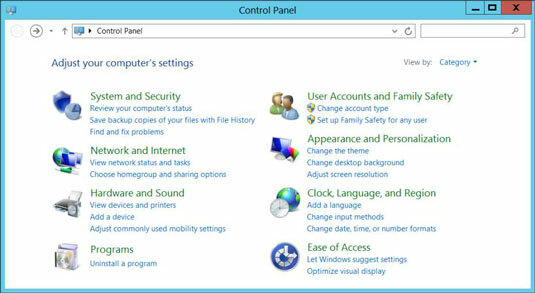 The Control Panel then lists alphabetized icons for every setting, sparing you from hunting through categories.